Secretary of State for Health, Andrew Lansley MP, officially opened a new state-of-the-art medical research centre in Southampton today. The unique £9 million pound facility will be a focal point for medical discoveries including the development of new treatments for respiratory diseases and the study of how our lifestyle and diet affects our health. The Southampton Centre for Biomedical Research, based at Southampton General Hospital, will revolutionise the way research and clinical trials are conducted. As a joint venture by the University of Southampton and Southampton University Hospitals NHS Trust and part funded by the National Institute for Health Research (NIHR), the centre will draw together some of the UK’s brightest scientists and doctors, working together in one place to translate the latest innovations made in the laboratories directly into new treatments for patients. 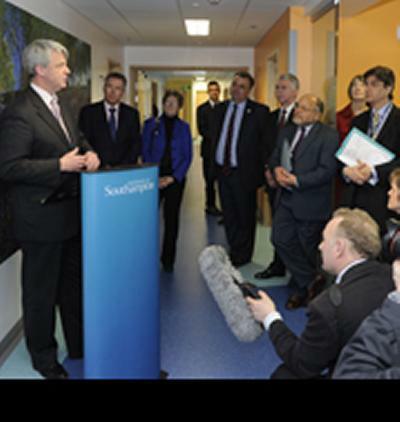 Andrew Lansley MP, Secretary of State for Health, says: “I am delighted to open this new centre in Southampton. In addition to developing new treatments for NHS patients, health research makes a vital contribution to the country’s economy and growth. That’s why we announced measures in yesterday’s Budget to streamline regulation, reduce bureaucracy and increase NHS clinical research performance. “This unique facility is an excellent example of partnership working. Together, the Wellcome Trust Clinical Research Facility and two national Biomedical Research Units are bringing together world class research. They are investigating the causes of respiratory diseases such as asthma, cystic fibrosis and lung infections; and examining how lifestyle and diet affects our later risk of heart disease, obesity and diabetes - which is unique in the UK. Facilities will include specially designed clinical trials areas for adults and children, a 2-bedded endoscopy suite, a paediatric environmental chamber to measure the exhaled air of asthmatics as well as office space for research nurses and support staff. Mark Hackett, Chief Executive of Southampton University Hospitals NHS Trust comments: "This opening marks yet another milestone in the development of the Trust as a centre of excellence in clinical research and reflects the desire, ambition and enthusiasm of our staff to be at the forefront of cutting-edge innovation for our patients. "Our successful partnership with the University of Southampton continues to thrive and the SCBR further cements our position as one of the UK's leading teaching hospitals."